Tbilisi, DFWatch – Muslims in Georgia, as well as around the World, celebrate Eid al-Adha, known as Kurban Bayram, major religious celebration from 12 to 15 September. The President and Prime Minister, as well as other state officials, congratulated Georgia’s Muslim community with the celebration Monday morning. ‘I wholeheartedly congratulate you with the Kurban Bayram – celebration of peace, support, hope and kindness overcoming evil,’ President Giorgi Margvelashvili’s statement reads, wishing families welfare, peace and happiness. PM Giorgi Kvirikashvili Sunday visited a mosque in Tbilisi to congratulate the Muslims. ‘As we all know, on this day Muslims help everyone surrounding them regardless of religion. This attitude retained the richest culture of coexistence in our country,” PM said. In Arabic Eid al-Adha means “Sacrifice Feast” and is one of the two major Muslim holidays celebrated each year. The second is Eid Al-Fitr, which is celebrated at the end of Ramadan, a month of fasting during daylight hours. Eid al-Adha is dedicated to the day when Prophet Abraham was deterred from scarification of his son by Angel Jabrail (Gabriel for Christians). 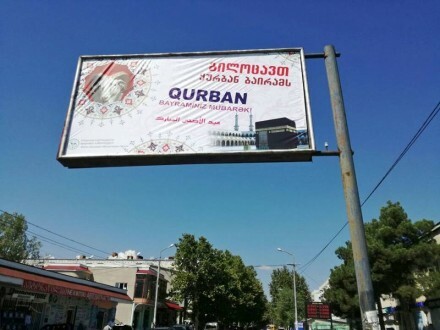 Muslims’ Department of Georgia organized installing banners in predominantly Muslim Marneuli Municipality.